Warehouse inventory software should provide managers with the tools they need to analyze stock and makes plans for inventory movement or replenishment. Used alongside a transportation management system, WMS systems serve as a critical part of an overall supply chain management system. Our Warehouse Management Software for distribution or Supply Chain is designed to handle all the needs in most efficient, effective & accurate way. Our Warehouse Management Software is committed to provide the best supporting system for the Retail & Distribution Business upgrading itself from time to time according to the market needs. WebXpress WMS is a cloud-based software to help customer gain real-time visibility across all the storage locations. 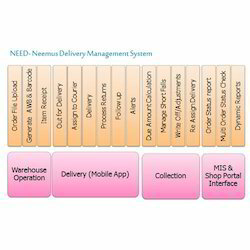 It helps manage all inbound and outbound operations from arrival to storage to location management and dispatch. The inventory management module allows to manage complex needs easily: tracking stocks of suppliers/customers, full traceability, accounting links, etc The inventory management module allows to manage complex needs easily: tracking stocks of suppliers/customers, full traceability, accounting links, etc. Warehouse management offers to manage different activities that take place within the warehouse including product’s entry, exit, stock management, inventory, sales, purchase, production planning, import, export, etc. VTL Logistics (India) Pvt Ltd possesses the complete strength to manage large and small warehouses with skilled resources including mechanical operations and IT. Our system is designed to manage your storage without the cost of maintaining documents or the sales count our system can handle your entire warehouse from any place in the world.